This first EMCC International Mentoring Conference took place last Friday 26 October 2018 in Barcelona. During th is one day conference, some 50 delegates from more than 15 different countries gathered together to showcase good practice, along with emerging themes and applications, with a view to making mentoring programmes and relationships even more impactful. The two representatives from Belgium Sophie Bocquet and Ana Escarpenter met each other thanks to the conference app that provided the lists of participants and speakers, the programme and all the practical information about the conference. 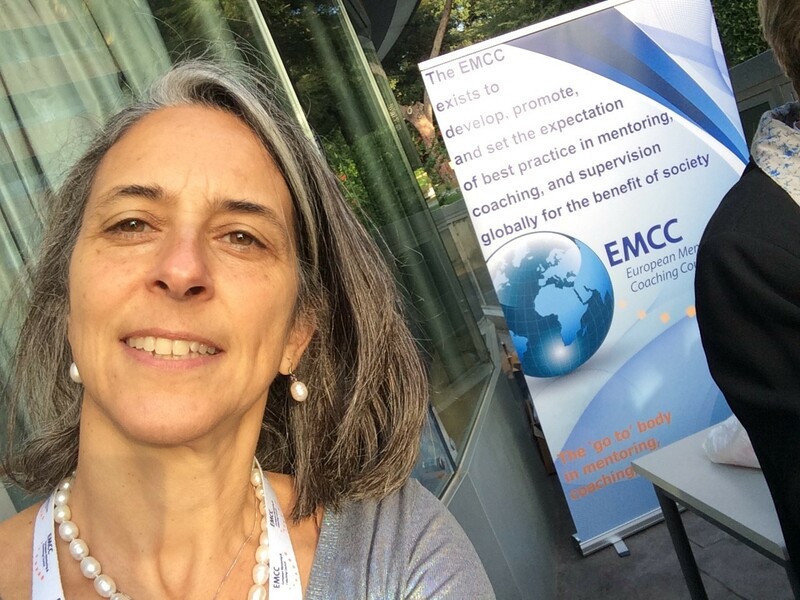 Olivia Verhulst, although from Belgium, is a member of EMCC-Spain and volunteering as "EMCC Accreditation - country collaboration and knowledge sharing"; she and was helping with the organization of the conference. The conference theme was presented from a global perspective: How mentoring can help today’s problems in society. The first subject, Mentoring and Migration, was introduced by the secretary of equality, migration, and citizenship for the Government of Catalonia. He explained how the Catalan government has searched inspiration in other countries before putting together their programme, which seems to attract great numbers of volunteer mentors in its first launching edition. This new programme seems to me to be very similar to those run in Belgium by organisations such as Duo for a job and alike. Time for an open air lunch break under a shining blue sky at the park of the La Salle Technova Barcelona University. This university is one of Europe’s leading incubators for innovative technology start-ups. Back in the plenary room time for questions and answers on the different International Standards for Mentoring and Coaching. • How do you demonstrate the bottom line benefit of mentoring? • How can organisations support mentors and mentees in making the most of their relationships? • How can we bring more mentoring programmes up to the quality benchmark of the International Standards for Mentoring and Coaching Programmes (ISMCP)? • What’s the role of new technology in mentoring in organisations? • How can we ensure the quality of mentoring programmes when budgets are limited? • How can we make mentoring work with mentees who have multiple needs? • What are the challenges of mentoring in less developed economies and how do you overcome them? • What’s the role of new technology in mentoring? • First clarify the needs, then define what’s the change/development they want to achieve, plan for an effective implementation and evaluate. • Get a local partner at the country to really find out the real needs. • Start ‘small and beautiful’, measure the impact, only then go higher in your goals. • Be creative, get in line with the trends in tech, technology is good for tracking and there are excellent language translation software tools, and you can get them for free! The third and last panel covered the subject of Mentoring in Business and Start-ups. • What’s special about business mentoring? • How can we enhance the impact this form of mentoring has on national economies? This panel session opened the discussion with the issue of free versus paid mentoring. Some participants were convinced that free business mentoring is rewarded with reversed mentoring and future investment possibilities. Others, compared mentoring services with those of consultancy which are always paid and the questions raised were: “Under what criteria to get paid?, What is the nature of the commercial relationship?, What is the right boundary for this situation?”. Getting clear answers to these questions was said to be the start of a good mentoring relationship. The Youth Business International programme was presented with examples from Russia and Spain helping young people with alternatives to the long term unemployment situations. This programme has a local partner in Belgium, MicroStart. Their offer looks like the one proposed by YouthStart and alike programmes in Belgium. Dr Riza Kadilar, President of EMCC International, closed the conference thanking EMCC Spain for hosting the conference and the participants for attending and actively taking part in it. Passionate, playful and deeply invested in empowering women and men in their life challenges, linking people with opportunities and contributing to creating awareness and understanding. Collaborates with multicultural organizations in which people development, dynamism, and performance are central. As a coach, mentor and facilitator I will not only support you but challenge you to grow!